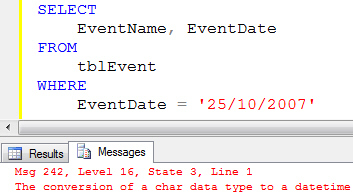 Now that you know a bit about how dates and times are entered and saved in a SQL Server database you're ready to learn how to write criteria in queries involving dates. 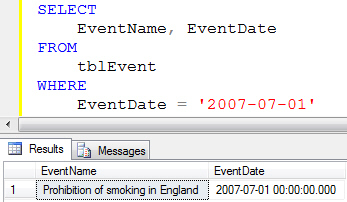 To use a date and/or time in the criteria of a query you simply need to enter it enclosed in a set of single quotes. The example below shows any events that happened on the 1st of January, 2000. Notice that we've used the ISO 8601 standard date format. We've used the international standard date format that we mentioned in the previous part of this blog series, but it's worth mentioning that a large number of other date formats are accepted in criteria. 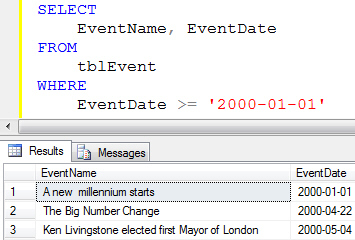 All of these date formats would work to show events that happened on the same date. Just to highlight why it's worth always using the international standard "YYYY-MM-DD" date format, here are some examples of when other date formats don't always give you the results you expect. Here we've tried to show events that occurred on the 1st of July, 2007 and returned one result. Here we don't find any results at all. This time we see an error message informing us that we're using an "out-of-range datetime value". 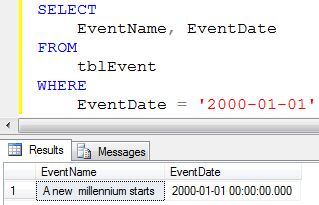 You can use the SET DATEFORMAT statement to change the default date format for a single query. We still think it's more sensible to always use the "YYYY-MM-DD" format when working with dates as it's internationally recognised, unambiguous and unaffected by the SET DATEFORMAT statement. As well as searching for something which happened on a specific date you can also look for records which occur before or after a certain date, or which fall within a date range. This works in exactly the same way as it does for numbers. To show things that happened on or after a certain date, use the "greater than or equal to" operators. 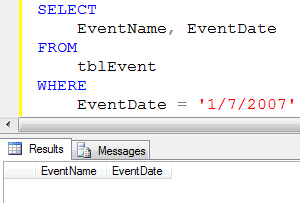 You can use the "less than" operator to find things which happened before a certain date. This shows everything that happened in the year 2000. Use BETWEEN to check for dates that fall within a certain range. So far we've worked with dates in the criteria of queries. 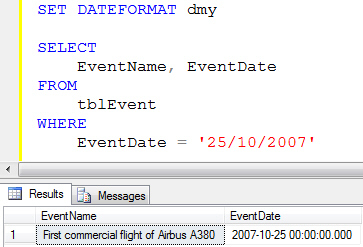 Whichever format you choose to write your dates in, you'll always see them output in "YYYY-MM-DD" format. In the next article in this series we'll show you how to change the format of dates in the output of your queries, including how to build elaborate custom formats.